This ANZAC slice is made with the same basic ingredients of oats, coconut and (wholemeal) flour, but layered with wonderfully crisp new season Pink Lady™ apples. Moist in the middle, crusty on the edge, the slice dairy-free too and made in one bowl, so if you are still looking to make something for afternoon tea, this would be a perfect treat! They went with songs to the battle, they were young.Straight of limb, true of eyes, steady and aglow.They were staunch to the end against odds uncounted,They fell with their faces to the foe. This morning, we’ve decided to celebrate ANZAC Day and remember those brave Australian and New Zealand soldiers fallen in battle, with an ANZAC cookie inspired mix and bake slice. Serve the slice warm with ice cream or double cream – it may sound a little overindulgent given the history of the biscuit itself and the nature of the morning’s proceedings, but think of it as a celebration of the freedoms that have been afforded to us by those who have fallen before. Lest we forget. 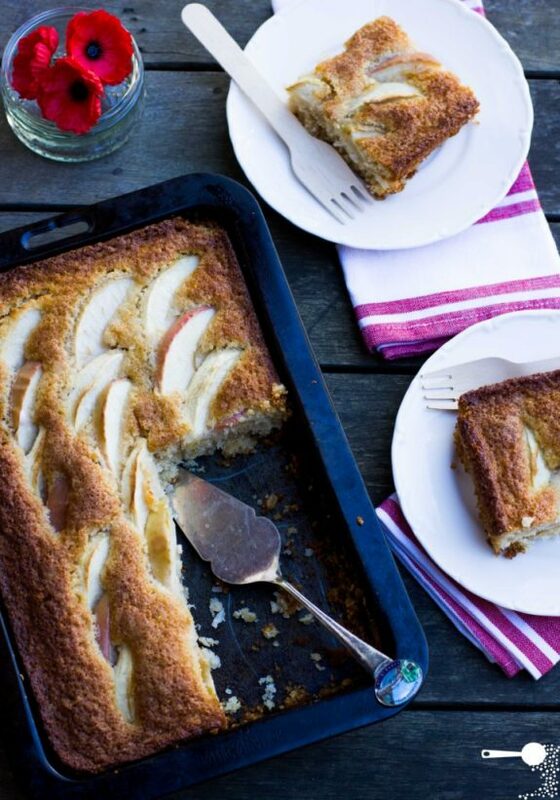 Super quick and easy cake that's made in one bowl and tastes delicious with apples, pears, or peaches. We used Pink Lady™ apples. Just a note, the oil is listed in grams, it is not a typo. Dessicated coconut works fine also, but you may want to add 3 extra tablespoons of milk. Cut apples into quarters, remove core. Cut each quarter into 3 slices, longways. Mix flour, baking powder, oats, coconut and sugar in a large bowl. In a measuring jug, whisk together the eggs, milk and oil. Pour the egg mixture into the dry ingredients and mix well with a wooden spoon. Grease a small slice tin with extra oil. Pour the batter into the tin. Arrange apple slices on top of the slice, alternating between peeled and unpeeled pieces. Bake in a preheated oven for 35-40 minutes, or until the cake has turned golden brown and a skewer insterted into the middle comes out clean. Cool on a wire rack slightly before serving. I love WWI history and your post sent me googling to learn why your remembrance day is on April 25 (I figured it had to do with Gallipoli but wasn’t sure how the date fit in). The wall with poppies is beautiful. It’s in the oven as we speak. Took about 10 minutes to whip up – hope it turns as yummy as yours looks. Thanks Justine, and yes, you are right – perfect for a picnic or lunchbox! This looks good. When I ran a b&b about 12 years ago, I found another ANZAC recipe for a cookie that is one of my faves. I may have to post it in honor of your post! Thank you so much, I’ve never actually made ANZAC cookies themselves because one of the companies that produces them, donates some of the proceeds from the sales to a veteran’s fund which I think is very thoughtful so I like to support them. But, if yours is as good as you say, I may have to give them a go! Very nice, I love your recipe. What a beautiful tribute! Do you serve it warm sometimes? I can picture how beautiful that would be with vanilla icecream next to it. It looks fabulous, but where is the ton of butter??? (Just joking!) I have just made ANZAC biscuits once more (I think I must have made them dozens of times, they are so addictive and so quick, easy…) and they are so buttery I already feel guilty after two. What a great tribute! This looks so tasty – and I like how easy it sounds. Beautiful photo with the red flowers. Great looking dessert too. gee, this looks divine!! gorgeous pics too. Lovely post. what can we use instead of peanut oil? We have allergies to peanuts in our household and was after a good substitute for it. 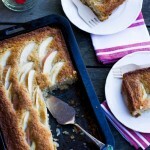 the recipe and the pix look delish! Thank you and I’m sorry to hear of your allergies. You could use any other type of nut oil (rec macadamia), melted coconut oil or light tasting olive oil if you want to steer away from nuts. I was looking for a “whole foods” recipe to use with some beautiful peaches that I have here. This cake might work really well with the peaches. I might try and replace that cup of white sugar with 1/2 c. coconut sugar and 1/2 cup stevia. I’ll see how it turns out! Thank you. Lovely! The coconut and apple sound like they’d go really well together. THis looks just divine and i’ll be giving it a run tomorrow. When did ANZAC biscuits become cookies? My apologies, Kathy, I’m ESL and sometimes I just can’t see the obvious… until it’s pointed out! Of course! Changing the working now. This looks delish! But can I clarify is it wholemeal plain flour or wholemeal self raising flour? I would assume wholemeal plain flour based on the amount of baking powder it calls for….? Thanks! Hi Sarah, it’s plain wholemeal flour. Enjoy! This is a lovely slice! Thank you Martyna! Going to cook this for work tomorrow and ask my colleagues to make a donation for an Anzac Day fundraiser. Congrats on the cookbook! I look forward to seeing the finished product as your styleing and Images are always fabulous and the recipes fantastic!